Men's Wearhouse and Jos. A. Bank have agreed to hold talks on a possible merger. Finally! Rival men's clothing chains Men's Wearhouse and Jos. A. Bank Clothiers are in talks on a possible merger, after months of making unsolicited bids for one another. Men's Wearhouse (MW) disclosed Monday that it has entered into a non-disclosure agreement with Jos. A. Bank (JOSB) under which the companies will exchange confidential financial data and hold talks on a possible deal. Last Thursday, Jos. A. Bank rejected the most recent offer of $63.50 a share from Men's Wearhouse but said it would be open to a higher bid. And Men's Wearhouse said it would be open to going to $65. The back and forth started in October when Jos. A. 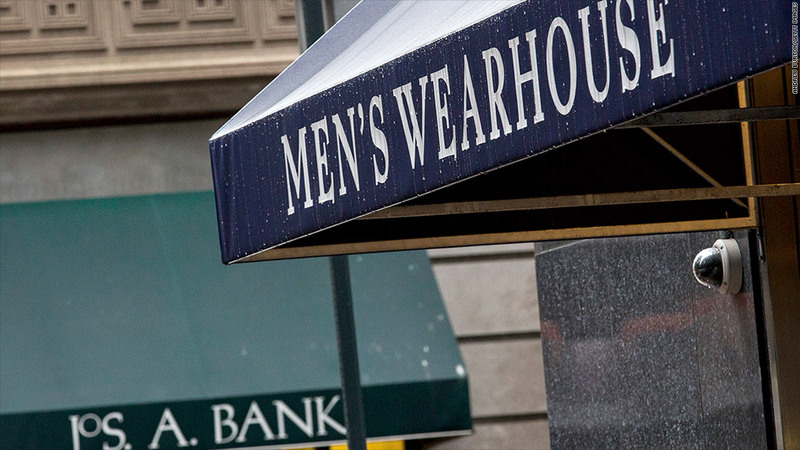 Bank, which has 629 stores, made an unsolicited $2.4 billion bid for Men's Wearhouse. In turn, Men's Wearhouse rejected that bid, despite pressure from its largest shareholder to consider the offer. So in November Men's Wearhouse, which has 1,133 stores, made an unsolicited $1.5 billion bid for Jos. A. Bank. It has since raised that offer twice; the most recent one would be worth about $1.8 billion. Men's Wearhouse also announced it would nominate two candidates for Jos. A. Bank's board of directors. Jos. A. Bank has taken numerous steps to fight off the offers from Men's Wearhouse, including adopting a poison pill plan. Two weeks ago, Jos. A. Bank reached a deal to buy clothing company Eddie Bauer for $825 million in cash and stock. But it can drop the bid if Men's Wearhouse completes its proposed purchase of Jos. A. Bank. Shares of Jos. A. Bank were higher in premarket trading Monday. Men's Wearhouse shares were not yet trading.